What gifts does this philanthropist bring me? Do we let him in? Is he a friend? a relation? Sure he has billions and powerful friends but is he a true philanthropist? someone who loves people? I don’t see an uncle Pierre in the lyrics… do you see one? or perhaps Pierre Omidyar’s philanthropic gifts are to Senator Feinstein and reserves his love to people with whom he identifies with. 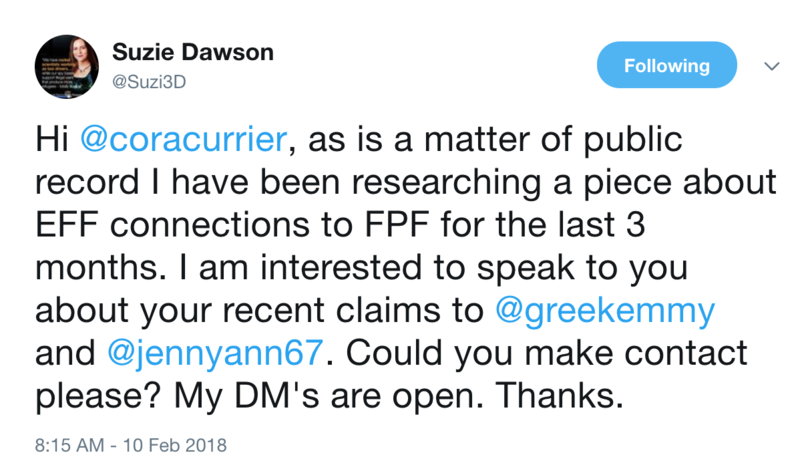 But news of Omidyar’s philanthropy towards a housewife, a librarian, and other solidarity activists in support of a Free Press, a free public library of persecuted documents at WikiLeaks.org did not go un-noticed. So when the Omidyar Network, after working hand in glove with USAID in Ukraine, after moving in to control disemination of US/UK National Security Agency / GCHQ information (Snowden archive) after investing in the safe pair of hands of the International Consortium of Investigative Journalists that has been handed treasure troves of Financial Corruption information, they are finally spreading their philanthropy in the UK by investing on The Bristol Cable, also, ” The Federation, a cooperative co-working space in central Manchester, Open Data Manchester, an advocacy group that encourages and shares open data, and Campaign Bootcamp, a nation-wide initiative to empower early-stage activists”. And I wonder, is Omidyar’s ‘The Intercept’ (his flagship philanthropic journalistic outfit), his ticket to open doors among the political dreamers and information innovators, is it truly sincere in its endeavours? 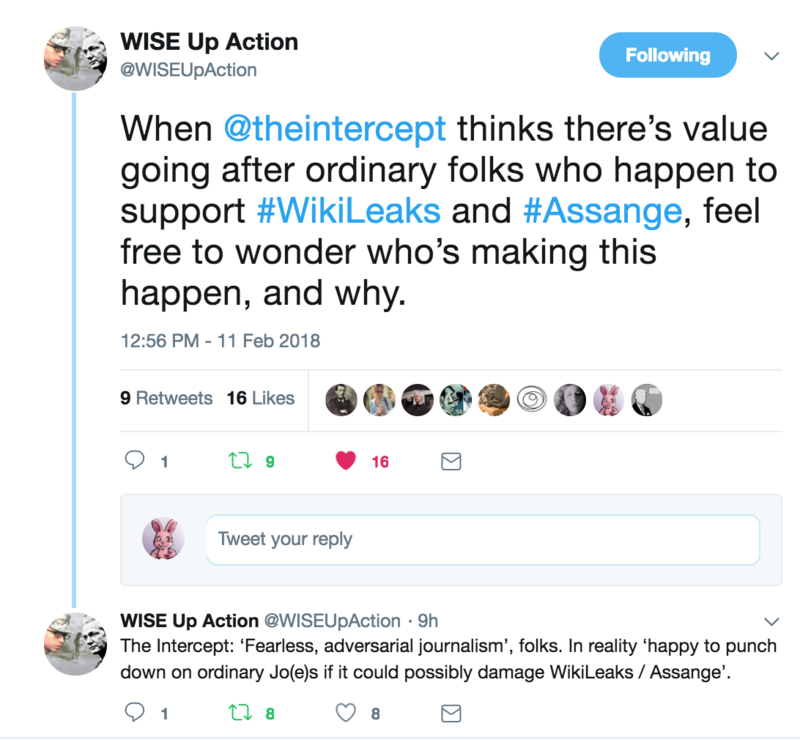 Is the targeting of WikiLeaks supporters and activists an early sign of Omidyar’s political vision for his philanthropic intervention in society’s political powerhouse that is political/national security journalism and, clearly, political campaigning? Let’s take a look at the Ukraine, a society, a country, deeply divided and wish away the influence of such philanthropists or any philanthropists that set their hat on shaping the public affairs and life of our societies. Another philanthropist, George Soros, who ‘broke the Bank of England at UK taxpayer’s cost into the billions, has also been spreading his philanthropy to the UK, God help us! Are them two friends by any chance? 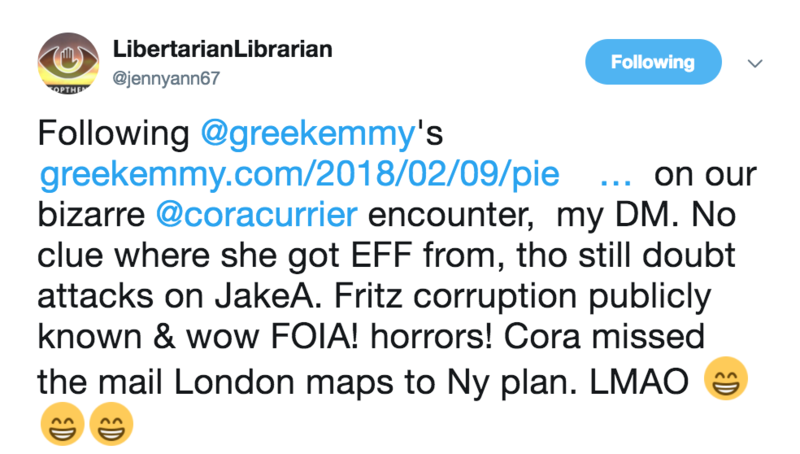 Now, let’s look at Cora Currier’s expertise in matters WikiLeaks. Has she written any past articles about them? It does not appear to have done so, but if you identify any please pass it my way. Surprisingly, in her 2013 “Charting Obama’s Crackdown on National Security Leaks” the WikiLeaks Grand Jury investigation is not mentioned. Censorship by emission? 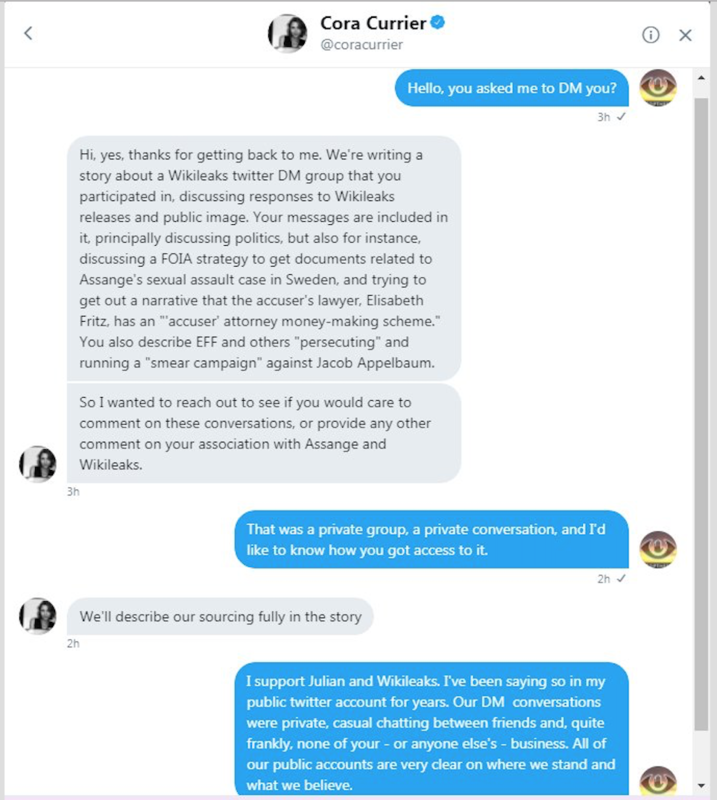 It is Micah Lee’s first tweet of a 14 part apologia of why he organised the expulsion of WikiLeaks as a beneficiary at the Freedom of the Press Foundation beginning with calling WL supporters an ‘army of twitter trolls’ and ending with accusing WL of anti-semitism. And then The Intercept targets five out of these “army of trolls”, for revenge? 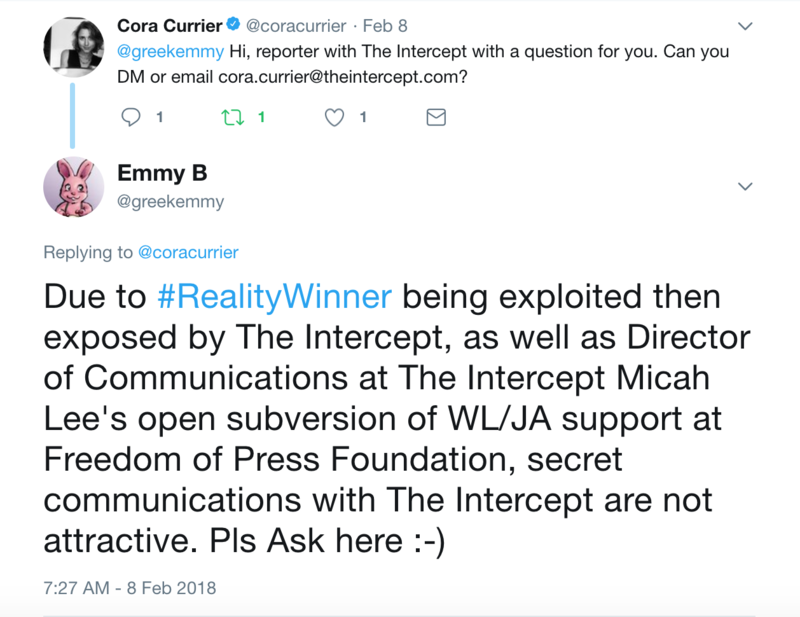 Another interesting thing is, there has been no evidence that Cora Currier has ever publicly reached out to a source via her twitter. By contrast, she is demonstrating a more professional approach here. 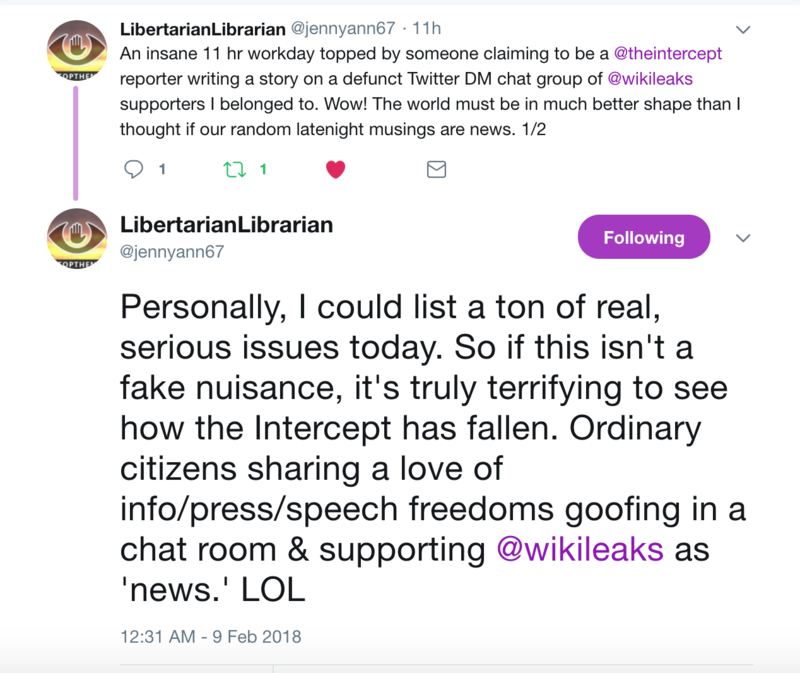 Perhaps the title of this article should be “How The Intercept weaponises a Twitter WikiLeaks supporters discussion group against the cause they support”.